What is a Global rule? Global rules are central versions of New & From Existing rules and Report rules in JungleDocs for Office 365. This means that they are not bound to the site/library they were created on, but can be used throughout your entire organization and by anyone within your organization. However, you can set conditions for a Global rule so it will only be accessible on certain sites and by certain user s.
An example of a Global rule would be a Reports rule: Create proposal that is accessible on multiple sites and by more than one user. How to create a Global rule? Navigate to an existing rule in JungleDocs for Office365 that you want to make central, or create a new one. Configure your rule, or make any changes to the existing rule as needed. Scroll down and select Save as global rule. This will prompt a new window to open in which you will be able to set where and to whom this Global rule will be available. You can select titles, collections and types but also templates and URLs. Save your rule and it will be ready for use. How to run a Global rule? Click on the required Global rule to run it. Depending on the rule (if it is a Reports rule or New & From existing rule) JungleDocs 365 will lead you through the further steps. You do not have to worry about a Global rule disappearing if it was stored on a certain library which then gets deleted because the project was completed. All your Global rules are conveniently located in one central location. You can set permissions for this site so that only certain users can edit or add Global rules. Best practice: we recommend that you assign Global rules on a Site per Client, Project, Case or any other organisational segment true for your organisation . Reason: using a structure like this, you can be sure that documents are easy to locate. 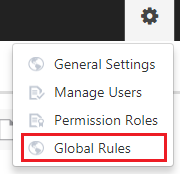 Best practice: you can easily manage all of your global rules by clicking on the Settings wheel in the JungleDocs UI and clicking Global Rules. This will prompt a window to open in which you get a quick overview of all of your global rules. You can also edit them or delete them from here.